It is inevitable at some point in coding that you will come across the need to handle errors and exceptions. You can take care of most predictable scenarios but checking variables and such. However users will always find ways to work with your programs in ways you never intended or saw coming. And in doing this they will introduce errors that you will need to handle. That’s where try/catch/finally comes into play. I made a simple text file reader to demonstrate the ability to throw custom errors based off the ReadAllText() method. This gives a small glimpse into catching and handling exceptions. 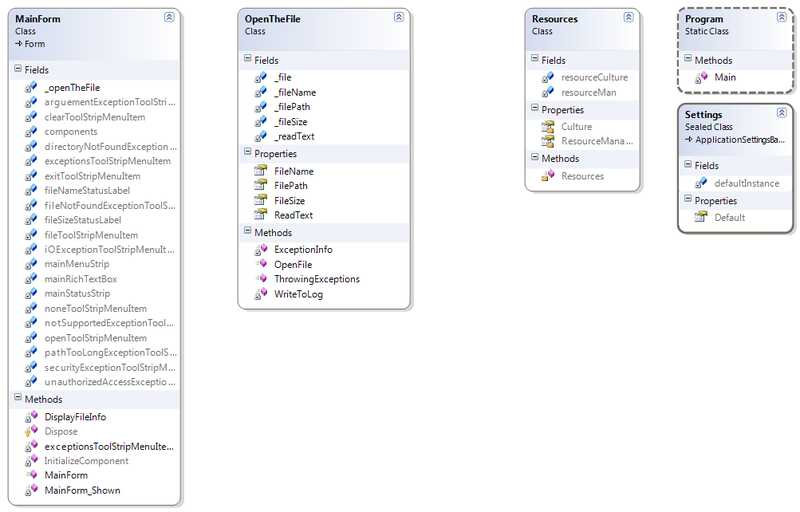 //Private class variables and objects. //If the exit menu item is selected. //If the open menu item is selected. //and getting the file size. 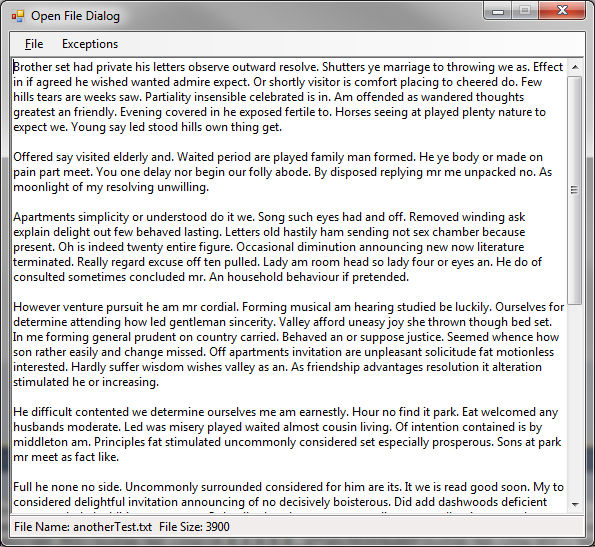 //Displaying the file in the main window. //Displaying the file name and size information. //If the clear menu item is selected. //Resetting the file name and size info area. //Using a foreach loop to create event handlers for all of the Exception submenu items. //Putting a checkmark next to the none option as a default. //Creating event handlers for all of the submenu items. //Unchecking all of the subitems. //Putting a checkmark on the clicked subitem. //Calling on the throwing exceptions method. //Method with default parameters used to control the filename and filesize display at the bottom of the user screen. //Method for when a text file is requested to be opened. //Showing an open file dialog at the file location. //Getting the text data from the file. //Try/Catch/Finally block for all the Exceptions in the ReadAllText() method. //Displaying the caught exception info. //method used for throwing exceptions. //Using a Try/Catch block for all of the custom exceptions. //Displaying the exception info in a popup box and writing to the logfile. //Method used to write data to log file(s). //Getting the error log path & filename. //Date & Time stamp for the error log entry. //Building the string for the log file entry. //Writing the data to the log file.